If you asked me to name 10 words that summed up this blog one of those words would certainly be “complacency”. It doesn’t happen much admittedly but enough to make me smile when I realise I have underestimated something. Our eventful visit to Lake Titicaca is a great example. For our second snow shoeing experience all-action guide Jean-Marc was back, and replacing Claire’s mum (who sensibly opted for coffee shops instead) was Claire’s sister and Australian Kate. 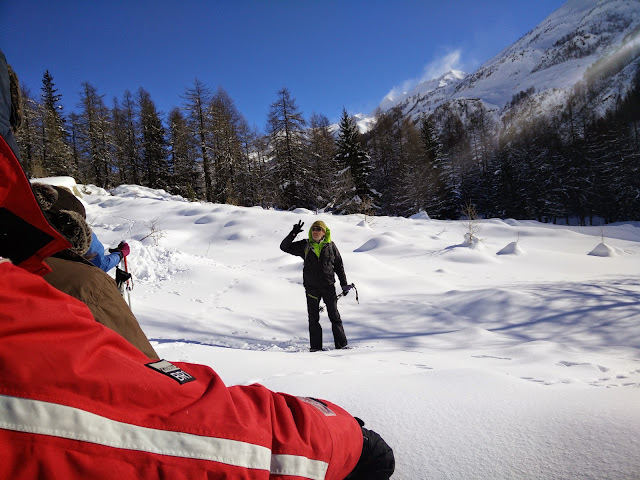 As we departed Jean-Marc announced that we were in fact going snow shoeing in Italy. Which would be my fourth country in 5 days, and my first ever visit to Italy. 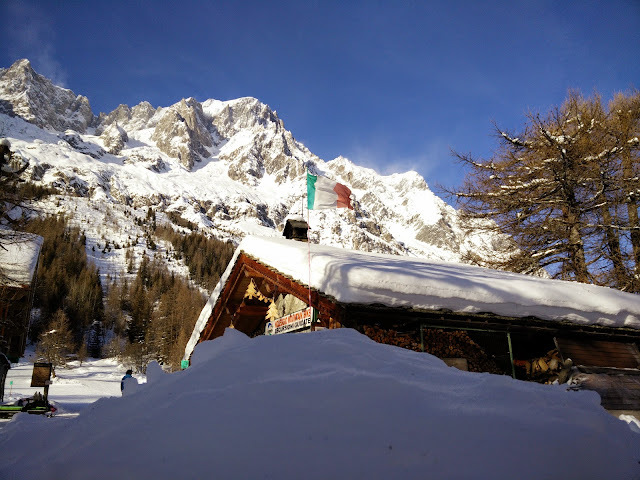 Chamonix is placed close to both Switzerland and Italy, so it doesn’t take much effort to get to or from either. Italy is reached by way of the incredibly impressive Mont Blanc tunnel, a 7.2 mile road tunnel which passes directly under the Aguille du Midi, one the highest peaks in the Alps. The tunnel took 6 years to build and over 700 tonnes of explosive. There was a horrific fire in the tunnel in 1999 as a result which 38 people died. When reading about the fire I came across the story of Pierlucio Tinnazi, an Italian security guard who worked at the tunnel. Upon hearing that there was a fire he donned breathing equipment and selflessly entered the tunnel again and again on his motorbike – an incredible act of bravery. He saved at least 10 people but sadly died trying to save more. Safety measures within the tunnel have since been increased. The tunnel delivered us into the Aosta Valley in Italy, a location even more picturesque than Chamonix. Jean-Marc drove us off of the main road and into a smaller valley. It was in this narrow valley that we were to don the snow shoes once more. I mentioned in the blog for our first snow shoeing expedition that some complacency had crept in. Jean-Marc immediately led us up into the trees and it wasn’t long until I realised that what lay ahead was going to be a lot more challenging than I expected. When snow shoeing in deep snow it is instinctive to look at the snow into which one is stepping. 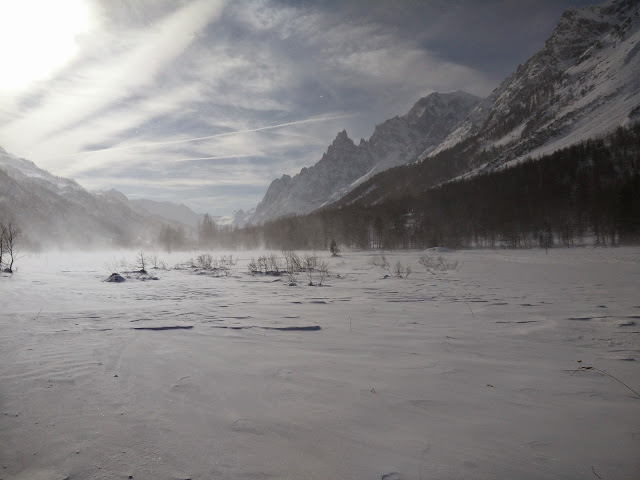 This is however a bad idea and, though illogical, looking further ahead leads to a far more easy and stable progress, Fortunately in the Aosta Valley the mountain are so striking that I soon forgot about the snow and spent much time gazing upwards. Then I would stumble and fall. Over and over again. The valley was very quiet and for the first 30 minutes we saw nobody. Then a group of faster walkers started to catch us, utlising the tracks we had laid down in the snow. Jean-Marc decided to crack upon his tea flask to let these walkers past. But I needed a pee so I climbed a little further up the hill into the fresh snow and positioned myself behind a small rock. I was mid-flow when I heard a commotion back at the tea stop. It seemed the other walkers had followed my tracks, presuming I was some kind of expert guide (understandable) and they had to be warned of what lay ahead. They quickly changed direction. Jean-Marc dishes out his mysterious tea. Our route was to take us up into the valley to a small restaurant. Progress was hard as the terrain was much more challenging than it had been a few days earlier. The pace was also ruthless and was aided by the fact that Claire and her sister both have a subtle competitive streak. At any one time one or the other would be right up behind Jean-Marc. As a result he responded by speeding up a little. Which was great for the members of our group who were feeling fresh and lively. Less so for me with my legs still fatigued from Barcelona, and for Claire’s Dad who, though more than capable of covering the distance, was very wisely less willing to push himself to the limit with no idea what lay ahead. Being the slowest in a group is hard. I know from mountain biking that if you are slowest the group will always wait, but by the time the tortoise rolls into the waiting group they are all keen to get going again. This was the case as we continued along the valley. Fortunately I learned a trick or two from being a slow mountain biker too. Utlising some flimsy excuse I asked Claire to carry our rucksack and then jostled my way to the front just behind Jean-Marc. Then I slowed down a little. Which worked for a while but you can’t just remove the competitive streak from people. It grows and grows, and soon enough I was back with Claire’s Dad wishing I had eaten more for breakfast. Another trick I also learnt from mountain biking is to always carry food though. After a couple of hours Claire’s Dad and I had to feast on cereal bars to keep ourselves going, which worked really well. We started to gain on the group and things were looking up. Then the weather turned. In mountainous regions the weather is often unpredictable, with bad weather seeming to materialise out of nowhere to catch the unprepared unawares. Cautionary tales are filled with accounts of people being caught out in this way. Around 5 minutes after I spotted some cloud coming towards us from the top of the valley the wind arrived. Jean-Marc estimated it to be around 60kmh, Judging by the speed of the snow blowing into my face I would guess it was higher, and it was blowing right into our faces as we crossed some open ground. The Sisters of Speed were way ahead, jockeying for position behind Jean-Marc. At the back Kate, Claire’s Dad and I quickly put all the clothes back on that we had previously removed as we climbed in the sun before pressing on into the icy wind and across the open ground. Jean-Marc waited for us at a marsh we had to cross. I am guessing he was taking us the direct route because of the weather because surely nobody would cross a marsh hidden under 2 feet of snow just for the fun of it. We all jumped across successfully with the exception of Kate who was unlucky and sank through the snow into the water below. Nobody wants water in their shoe in sub zero temperatures. Jean-Marc explains something that involves the number three. Shortly afterwards we reached a steep downhill slope. Jean-Marc offered to take a photo as we descended together, but we suggested a video would be better. He positioned himself with Kate’s iPhone and counted us down. All together we threw ourselves forward. I bounded for a while, using my long legs to great effect, until one foot sunk too far and a collapsed face first into the snow. As I struggled to extract my head from the snow I was aware that everybody else had descended in similar fashion. Sadly Jean-Marc had his finger over the lens so you will never get to see this. And I can report that snow melting in the ear is a really unpleasant experience too. We pressed on a little longer and eventually reached a small hut with steamy windows. Inside it was full of people hiding from the weather and feasting on some incredibly delicious looking food. Jean-Marc used his reputation to secure us a table in the corner. The food was what I would categorise as “man food”. 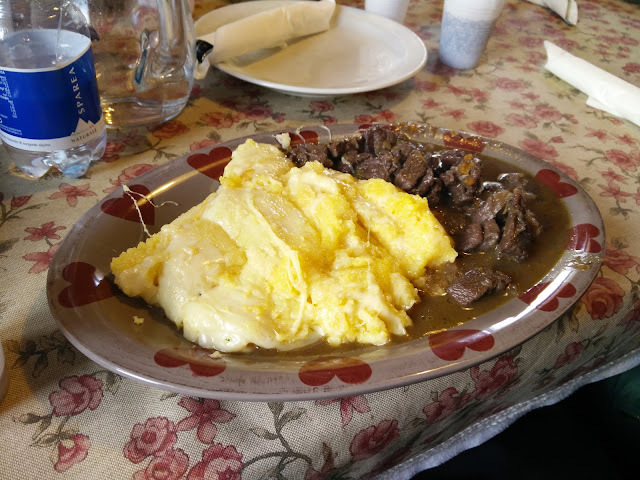 For example, I had Boar Stew with cheesy polenta. None of the valuable space on my plate was wasted with vegetables, and in fact it seems that I forego most of polenta to make room for an astounding amount of cheese. 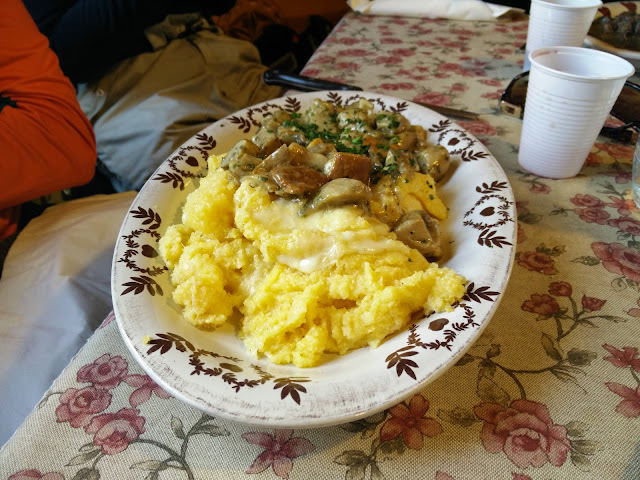 What I ate in fact was wild pig and cheese, with some polenta swirled in for effect. It was the perfect meal at that time though. No great adventurer ever stumbled out of the icy wilderness and was heard to whisper “I could murder a salad”. Then, to complete the most welcome meal I have had for many a year Jean-Marc recommended that we try a local speciality. 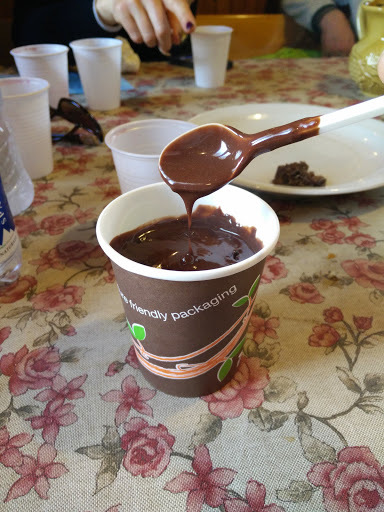 A chocolate drink so thick and luxurious that I was immediately looking around for some churros. When we ventured back outside the weather was still awful. It was notable that nobody else in the restaurant seemed to have any interest in leaving, but a belly full of cheese, pig and chocolate is great fuel so we set off. This time we had the wind behind us and it carried us along, and at times blew me off my feet. Jean-Marc very quickly decided to take us back the quickest route, along the bottom of the valley and using established snow shoeing and cross country skiing tracks. I took endless photographs on the way out but only one on the journey back. Here it is. That misty air is in fact snow blowing past me at incredible speed. It was still hard going but we made very quick progress and after an hour or so we were back at the van. Exhausted, well fed and happy. It was the sort of the experience that left us smiling with the pleasant sensation of having achieved something to be proud of.